I wrote recently on GTD & The New Age Movement and how Christians can baptize GTD for their use in leading productive and holy lives. Here is a good opportunity for those Christians who celebrate the liturgical season of Advent to do just that. We have a new Advent calendar in our house this year. It is a five-foot-tall fabric angel with twenty-five numbered pockets sewn on the front of her dress (Pottery Barn Kids). Instead of loading the pockets up with treats or toys, we printed a set of Jesse Tree ornaments and mounted each one on a square of red cardstock. With a quarter-inch red border, these ornaments fit perfectly in the pockets. The printable includes a page with a table that names the picture on each ornament as well as chapter-and-verse references to related Bible passages. The table was sliced into strips and distributed with the ornaments into the pockets. Each day, just before dinner, the ornament and Bible reference were drawn from the pocket and after reading and discussing the Scripture, the ornament was hung on the barren branch of the Jesse Tree. Yes, the Advent calendar itself served as a reminder to read the Scriptures daily, but it wasn’t the white strips of paper that prompted me to write this post. It was the little strips of green paper that bore certain reminders like “Trim the tree today” and “Start baking cookies”. My wife had turned our Advent calendar into a holiday tickler file! Maybe my enthusiasm for GTD is finally rubbing off on her. Does GTD Contain New Age Teaching? GTD works if its mechanics are applied consistently. At the lowest level, it is just a system of tricks and reminders. The Philosophy behind GTD is problematic, however, for those who wish to avoid New Age teachings, including Christians. For anyone who didn’t know, David Allen is heavily involved with the Movement of Spiritual Inner Awareness (MSIA) and he subtly promotes Zen Buddhism and New Age teaching in his GTD materials. The most obvious teaching is the constant focus on the “mind like water” philosophy he adopted while studying karate, but taking all of the talk about “psychic RAM” and “open loops” into consideration, it clearly goes much deeper. His motivation is to keep his mind empty (and yours as well) by closing loops (like electrical circuits) so that good ideas (positive energy) can flow through him (and you). This is the creative work of the universe, a concept too deep to cover in this post — just know that it means more than being creative according to the conventional meaning of the word. This begs the question, is it appropriate for Christians to practice GTD? After all, didn’t Saint Paul warn his disciples about being led astray by empty philosophies that sound really good? (Col 2:8, c.f. Gal 4:3) The phrase τὰ στοιχεῖα τοῦ κόσμου, translated as “principle elements of the world”, can be interpreted to mean astrology or even the New Age movement in general. I suspect any good Christian GTDer that has read this far is already kindling a small bonfire with the intention of pitching in all extant context lists, tickler files, and printed materials published by David Co. Not so fast. Didn’t Paul also advise to test all things and hold fast to that which is good and reject that which is evil? (1 Thess 5:20-22; and though he was referring to prophecies that may be wholly or partly false, the same approach may apply here.) If the mechanics of GTD work, can we not keep the system and reject the Buddhist underpinnings? I for one would say that this is a reasonable idea, though some precautions might be prudent. It is unlikely that any informed and faithful Christian will wander into the cosmic abyss of Zen either accidentally or willfully (the former being a spiritual danger and the latter being a mortal sin). Therefore, it is important for Christians to remain informed so that they may remain faithful (hence, this post — you’re quite welcome). It would also be good to put some thought into how GTD can be used to help keep us focused on the right things to do. For example, if you find it difficult to schedule a consistent time for prayer, place a reminder in a context that you enter frequently with a few free moments to spare. Incubate a follow up with someone in need a week or two after your last telephone conversation. Slip mailers, flyers, church bulletin inserts, and even hand-written reminders of radio commercials requesting charitable donations in with the bills or into the tickler file folder for your next pay day. Jot down the chapter and verse of a passage you want to research later and when you process your inbox, add it to your @BibleStudy list. Of course, you can always allocate time on the hard landscape of your calendar for prayer, study of Holy Scripture, meditation on the Word of God, and the performance of charitable works. Applying GTD for the express purpose of spiritual renewal is a good way to baptize GTD for Christian use. New Age teachings are very subtle in the first GTD text. You have to know what you are looking for. Allen’s second book, Ready for Anything, is a different matter altogether. Here is a compilation of quotes from that book. This first quote is basically a restatement of the Law of Attraction, which holds that energy attracts like energy. Visualize positive outcomes and they will come about. Think negative thoughts and they will lead to negative outcomes. This is an extension of the traditional concept of Karma with a very scientific-sounding name. Making it sound like an application of physics, New Agers sell this as a deterministic formula for obtaining what you want in life. So you are doomed to suboptimality if don’t focus on having only positive thoughts, and what’s worse is that you’re not very good at it from the start. Your problem is that you’re not willing to believe that something already exists even though — well, to be frank — it doesn’t. Don’t trust me? Here, I’ll say it again in a different way. My apologies for the sarcasm, but humans have never had the power to create anything out of nothing, nor to simply will something into existence. This concept should sound familiar to the Christian, however, for God did create the universe ex nihilo (out of nothing) by an act of sheer will. The New Age promises to make believers like unto God, or to put it more correctly, to help them harness the powers they already possess as parts of God. Rejecting the need for our God the creator was precisely the nature of the Original Sin [Genesis 3:4]. Allen must have realized at some point that some potential disciples may object to his methods because they are unsure of his motives, so he tries to set them at ease by claiming not to be a spiritual guru. However, in the very next chapter, he boldly states that it is all about the spiritual, that there is no benefit otherwise. This excerpt seems self-contradictory at first. “Follow me and put yourself in control yet admit that you aren’t really in control at all?” This makes no sense unless it is evaluated in the context of pantheistic belief in the universe. Similar to collective consciousness, this belief extends far beyond sociology into the realm of metaphysics. In the New Age, there is no conflict between you, the universe, and God, because you and the universe are God. Allen’s remarks can basically be interpreted to mean that everyone must control what they can as best they can, because everyone is steering toward a unified oneness anyway, and variances between the will of the person and the will of the collective consciousness only hinders (but will not ultimately prevent) progress toward that end. One way in which New Age practitioners attempt to gain converts is by convincing people that all religions are founded on a single set of basic universal truths. They borrow a little from here and a little from there, and then challenge you to re-evaluate your own worldview in light of all of this “empirical” evidence. Yes, you read it right: until she is. This is a fairly common New Age jab at traditional belief systems, and especially Judaism and Christianity which, for important theological reasons, always refer to God in the masculine. Statements like these attempt to reduce this Tradition and its sacred language down to a mere absurdity, thereby appealing to the liberal-minded culture of our postmodern age. It tugs especially to the heartstrings of those who hate the Church for her (perceived) bigotry as well as those who are so enlightened that they can only muster a claim to be “spiritual” but never “religious”. In this case, the “evidence” cited to illustrate the narrow-mindedness of Western Christian thought is the criticism of Biblical Creationism as scientifically false (which is a red herring) coupled with the empirically-verifiable existence of ancient cosmogony stories that involve “Mother Earth”, such as Native American folklore and the Greek myth about Gaia the earth goddess. How do GTDers manage shopping lists? As I see it, there are at least two primary approaches: specific-item reminders and using lists as reminders. The first is derived from the GTD text itself. Throughout his works and interviews, Allen consistently uses phrases like “buy cat food” as examples of mundane tasks that require some reminder; thus, each item on one’s shopping list would be a new record in the system. But when does this thought occur? When the current bag of cat food runs empty? The truly GTD-savvy would scribble this reminder on a slip of paper and bury it three-quarters of the way down each new bag of cat food they buy. (In business, we call this the “reorder level” or “reorder point”.) The reminder is added to the @Store context list, of course, so that the cat food will make its way into the basket like magic on the very next trip to the grocery store (or in the next online order delivered to your doorstep if your are so technologically inclined). Canonical as it may seem, managing each new item as a reminder will inflate the ol’ GTD system fairly quickly. Maybe a more practical approach would be to slip a grocery inventory sheet into the Tickler File on the day prior to the next scheduled visit to the store. This will remind you to take stock of the pantry the night before. Once the inventory sheet is filled out, just slip it into the @Errands folder in your briefcase. Of course, this won’t help you when it comes to your attention (outside of the inventory activity) that something is needed, so you must either trust yourself to rediscover that item during the next inventory or deal with a potential hit to your confidence in the system by storing the reminder in some other way as well. Alternatively, the inventory sheet is kept close-at-hand as reference material, a sort of planning tool for the project “Next Shopping Trip”. This way, a needed item can be checked or written in as soon as the need is recognized. Tablet/Smart Phone apps excel in this capacity. There is the concept of a perpetual inventory, of course, but even my most obsessive-compulsive friends haven’t gone so far as to install a kitchen inventory computer system complete with bar code scanners. A well-positioned “running list” is a simple and cost-effective solution. Wish lists are a similar beast, though it may be a bit presumptuous to log each item on the “Waiting For” list. The question of how well The Paper Tiger filing system (c.f. Barbara Hemphill) integrates with GTD was posed on an online GTD forum about a year ago. I had never heard of it, so I started to dig and was pleasantly surprised by what I found. I had dreamt up a very similar system a few years before, when I first started experimenting with GTD, but dismissed it as a “crazy idea”. I’m not yet convinced that it is the best system, so I have not implemented it myself, but I do think it is an interesting concept worthy of exploration. Disclaimer: My opinions below are based on Paper Tiger software training videos on YouTube and information gleaned from websites and ‘blogs. I’ve never read the books or used the software, so it is entirely possible that I’ve left something important out here. Despite the cool name, this system at its core is nothing more than an index of papers, a document inventory if you will. Each paper document is recorded in a database, the three most important data fields being title, location, and keywords. The location is a combination of the named storage location and a folder number; for example, “2011 Tax Return” may be located in “Reference #359” or “Drawer D #42”. Of course, the software has bells and whistles to make operations like moving, merging, and purging files quick and easy, but a bare-bones system could easily be created with text files in a directory where the file name is “Location – File Number – Title” and the contents are the keywords. Homegrown spreadsheets are probably a popular alternative to the software as well. An incoming document is filed in the next available folder, which the software identifies automatically. Keys to success include keeping the physical files in-sync with the database, and purging files on a regular basis — and the software provides controls to assist with both. My first reaction to The Paper Tiger was that this was not going to work with GTD at all. The reason was based on how files were split between “action” files and “reference” files, which I perceived as a similar but separate GTDesque system. When I learned that “action” files simply meant those papers that need to be close-at-hand because some action is tied to them, my skepticism subsided. I then saw how this system could potentially integrate quite naturally with GTD. Action Files. Let’s consider this concept for a moment. GTD advocates using papers as reminders about things that must be done (think tickler files and the trick of leaving that important file under the car keys near the front door so your remember to take it with you in the morning). In essence, an “action file” is really just a reference file according to GTD nomenclature. Instead of shuffling an actual document around, a reminder bearing the file location could be used instead. This provides several gains. It reduces the bulk, making the GTD system more uniform and fluid. It also keeps all of the working files together, at hand, making it easier to regroup if the GTD system becomes stagnant — just dial through the folders and create a completely new set of reminders if necessary. Having prelabeled folders cuts down the resistance to filing even more than using David Allen’s recommended A-Z system, and retrieving documents becomes an almost mindless effort. Allen claims that filing with an A-Z system reduces the number of places a document could be, but how can that be better than just searching for it on the computer? Reference Files. If Paper Tiger filing provides enough value when dealing with working papers, then seemless integration with the permanent filing system makes sense. It’s also scalable. Adding file cabinets means defining more locations in the system. Regarding GTD, Allen acknowledges that filing needs vary depending on the type of records (e.g. customer or client records) and how the files must be shared with others (e.g. coworkers). I suppose as long as The Paper Tiger system is the established norm, there is no reason why it cannot work. As attractive as it looks, there are several reasons why I will not use The Paper Tiger myself, at least not on a large scale. First and foremost, I am married to an avid filer, and this system does not mesh with her way of thinking. If I were single or dealing with a set of files over which I had exclusive control, I might be more willing to experiment. We do apply the K.I.S.S. Principle (“Keep it simple, sweetie!”) as much as possible when managing the household, and to be honest, our filing cabinets are not out of control, so why mess with a good thing? Likewise, my team at work is not going to buy into this one at all. Another reason is that I’m always trying to eliminate paper, not file it, and while The Paper Tiger can be used to index electronic documents as well, today’s operating systems usually sport respectable document search features. Third, I really don’t want to find out what happens when the system crashes or becomes corrupted. Backups help, of course, unless the corruption is slow to spread through the system. My GTD journey began in 2009 at both work and home. I’ve already written three posts about by workplace implementation, but I managed to postpone writing about my home experience until now, over five years later! It was in part because I gained so much more ground at work and at a rapid pace, and I had something exciting to share. At work, I was completely in charge of my workspace and I enjoyed the freedom, time, and energy to establish and use my system at I saw fit. Home was another story. Evenings and weekends were usually filled with family and household obligations. Most evenings, I was too tired to think by the time my “me” time rolled around, and the sheer volume of “stuff” I needed to process was overwhelming. And the worst of it was that, not only must I share a workspace, but I was met with a lot of resistance. To be honest, none of that has really changed much. I tried so many things to make GTD work at home and racked so many lessons learnt, I didn’t have anything worth writing about. Now, I finally have a system that works well. I have the same basic mail services that most people have (e-mail, voicemail, and snailmail), and like most GTD neophytes, the first thing I did was rush out and buy a physical inbox to collect incoming stuff, both paper and non. Physical Inbox. I bought a HŌM-branded multipurpose tray from Walmart which is basically an oversized paper tray with angled sides such that the top opening is larger than the bottom. I figured this would be good for holding a lot of stuff, even bulky items within reason, like flashlights requiring fresh batteries or toys in need of repair. I still use the tray, but I put things there myself for the most part. There seems to be this fear that items that go into the box will simply be missed (or even purposely ignored); ironically, because the box is not used as a regular collection place, that is exactly what happens! I don’t expect anything to show up there, so when something is put into the box I may not see it until days or weeks later. E-mail. Nothing compares to Gmail’s labels and filters. I love opening my inbox and having a good general idea about what’s in it by simply scanning the brightly colored labels. It makes a serious difference when I need to scan but not process my e-mail. The recently added categories (e.g. Social, Promotions, Updates, etc.) are proving to be really useful too. Voicemail. This albatross, on the other hand, I loathe. E-mail me. Text me. Why are we still leaving voicemails these days? Well, I still have to deal with them, so I usually go straight through the queue and write each call down on a list, including date and time of the call, the number, the caller, the purpose of the call, etc., and then I process the list immediately after hanging up. This takes a little time and attention, so I unconsciously resist this task, often until my mailbox is full and I get text messages and e-mails to that effect. (Again, why not just e-mail me from the start?) On one phone line, I do enjoy automatic transcription of messages delivered by e-mail, but the resulting text is often butchered so badly that it is more a form of entertainment than a productivity tool. Snailmail. Mail delivered to the house aggregates on the kitchen bar. It is never placed into my inbox lest I miss a bill or a bank statement or some other correspondence that demands my immediate attention. Not that I’m informed about such things — I have to search and re-search the stack periodically to see if anything new shows up. It would be far more efficient and effective to just place all mail directed toward me in my physical inbox and then give me the time to deal with it, but I finally gave up on this crusade. I now consider the kitchen bar an inbox. Hey, at least it’s consistent. My Chair Isn’t “In”. I have precisely the same problem at home that I had at work when I started using GTD five years ago. The only difference is that at home the problem hasn’t gone away. While it is unfathomable to put something in my physical inbox, it’s perfectly acceptable to place it in the seat of my chair only three feet away. And it isn’t one thing either, but five or six at a time. Want a guarantee that something doesn’t get done? Prevent me from sitting down to work on it. I’m not trying to be passive-aggressive either, I just get very frustrated when I can’t sit down in my own chair, and then I tend to avoid the workspace altogether. Camera Phone. A picture is worth a thousand words. See something at the store you want to buy later? Snap a pic with your camera phone. A buddy of mine captured his daughter’s class schedule and locker combination when school started the other day just in case they are needed at an odd time. I have a lot of pics of books that I find at bookstores that I want to consider checking out from the library or purchasing online later. I still get backlogged in processing these, but its a great capture tool. As if collection didn’t have enough woes, I suffer from two serious downstream problems: no space and no time. The space constraint affects organization. Let’s say I find a child’s toy in my physical inbox in need of repair but I cannot complete the job in the moment. I have two choices: put it back into the inbox (wrong!) or allocate a space for it on my desk or credenza. The latter happens and not only does the room start to look cluttered, but I eventually run out of space to work! I have found no solution for this problem so far. The constraint on my time available to process does have a workaround: I stuff it all in my bag and take it to work where I can process at lunch. This really only works for paper, but it is an effective workaround. Processing and organizing are almost the same activity in my opinion. Short of trashing it, an item always requires filing and/or the creation of at least one reminder in the system. I like to get rid of things, so I try to work electronically as much and as often as possible. Google Calendar. As a user of Gmail, it makes perfect sense to use Google Calendar too. It works well, has a clean interface, and integrates well with other tools (such as Pocket Informant, about which I plan to write later). I eventually set up a family Gmail account and started using the Google Calendar in lieu of the calendar on the fridge. Since Android has permeated our household in the last few months, it has become much easier to live according to one shared calendar. ThinkingRock. I have tried a lot of GTD software “solutions” (for which I’ve already started posting reviews) and I finally decided to use ThinkingRock exclusively for organizing projects, action lists, etc. I found it somewhat by accident. I downloaded the Android app (along with several others) and I quickly passed it off as inadequate. When I later started to delete the apps I wasn’t using, I thought I might give it one more look. That’s when I read that the app is just a simple front-end that syncs up with the full desktop application. The screenshots alone told me that the desktop program probably fulfilled most (if not all) of my requirements for a proper GTD system. What’s more, I consider the data in my GTD system as very sensitive, so I don’t particularly like it being in the cloud. This app saves data locally, and when I sync up the tablet, I can leave my laptop safe at home. I find myself (or can easily place myself) in these contexts frequently. What may not be obvious is that the locations are not simply locations, but the gear available in those locations as well, and I choose contexts as appropriate. I know, for example, that I have a scanner at home and a reliable fax machine at work, so I don’t feel like I have to have contexts like @Scanner or @FaxMachine. The Tickler File. The good ol’ tickler file did not survive at home. As it turns out, I don’t have a lot of items at home to incubate, and since most decisions are family decisions, a personal tickler doesn’t make much sense. For many events, we make a soft commitment to ourselves to attend, mark the date on the shared calendar as optional, and then decide to break the commitment if something else more important comes up. I suppose David Allen would consider this as one way of feeling ok about not doing something because we know what it is we are not doing. Labeled File Folders. David Allen’s logic concerning hanging file folders and file cabinets really influenced me. I purged the house of hanging folders a long time ago, opting instead for basic manila file folders held in cardboard folder holders (Fellowes Banker Box brand if memory serves). I also invested in a personal labeller. Despite Allen’s advice, this one is battery-powered for convenient use throughout the house. Since I always keep boxes of AA and AAA batteries in stock, I wasn’t too worried about running out of juice at an inconvenient time; besides, batteries seem to last forever in this thing. The labeller is shared, also despite his advice, but it stays in my office when not in use, so I don’t recall at time when it wasn’t there when I really needed it. Family records are stored in our one file cabinet, personal records that only I care about are stored in file boxes, and a small set of folders that I use very frequently or in holders next to my desk. Reference. As I’ve already mentioned, I like to work digitally as often as possible. I will admit, I’ve always been a bit of a packrat (or is ‘compulsive hoarder’ more politically correct?). In recent years, with storage space becoming more precious as the family grows, I’ve come to terms with the idea of scanning things to which I’ve attached some sentimental value, like old school work. It has been a constant cycle of sorting and combining stacks of paper, purchasing additional storage containers, and preparing for batch scanning, but I’m finally about ready to plough through it all and free up a lot of space. Meanwhile, new stuff is digitized almost from the start. Evernote. Evernote is my primary reference tool. I have tons of links and snippets organized into notebooks, tagged as appropriate. I usually draft my posts on Evernote as well. The Android app is awesome, though I did lose a lot of work once when a syncing glitch fried one of my entries. Inspired by The Secret Weapon, I briefly considered using Evernote to fully implement GTD, but decided against it because, being a general-purpose tool, it lacks a certain solidity. I felt the same way about TiddlyWiki before it. Unrestrained customizability can be a very bad thing. At a minimum it is a distraction, but I think it intrinsically compromises the trustworthiness of the system — and if a GTD system must be anything, it must be trusted. In addition, I found it more calming psychologically to have separate tools dedicated to specific tasks. This is my reference tool, period. Brandon’s Notepad. Of course, this site is also part of my reference collection — that’s why I created it! I draft posts in Evernote, but they are deleted once posted so that there is only one source for a particular topic. The frequent review of commitments is probably the hardest habit to keep and the biggest stumbling block for most GTDers, myself included. Thankfully, this is where ThinkingRock really shines. At the end of my post on Commitment Management I discuss making the weekly review stronger by shifting the focus off of next actions and onto projects. In ThinkingRock, I use the project tree in the lower-left corner of the project view to drive my reviews. That way, I don’t waste time reviewing the granular details of every related action, especially since I do sometimes plan out a few key steps in advance and not just the next one. Having immediate access to success criteria for both project and action is also invaluable. Any actions that happen to be unrelated to any project show up in the ‘Single Actions’ tab in the same window pane, and I do review those, primarily to see if I need to force myself into a particular context during the coming week. Not a lot of magic here. Doing is doing is doing. Here are a few observations, though. Queues. I’ve found that a lot of GTD doesn’t have to happen if I establish queues for myself. Reconciling receipts, entering contact info, ripping CDs, and other tasks can be queued up for batch processing. In substance, this isn’t much different from any other list of actions, except that a reminder doesn’t need to exist for each receipt, business card, or CD. The location of the queue is usually driven by storage requirements, and that may or may not be in the most favorable context. For example, I can usually carry my unreconciled receipts and statements with me to work on at lunch time, but I cannot carry my entire CD collection with me for ripping. Working through queues usually requires no reminders once the ball gets rolling, a possible exception being for those tasks for which I want to dedicate a regular time on the calendar, say, each week. Recurring Reminders. I made the mistake of setting a bunch of recurring reminders, only to find that they are not very effective. Creating the action “Replace HVAC filter”, which should recur every month, sounded like a great idea, but the cycle never seemed to be very stable. Part of the problem was that the replacement itself was not necessarily the next physical action. I would usually wait to buy a new filter until it was time to replace it, so the next action should have been “Buy HVAC filter”. That worked in those months of heavy air-conditioner usage, but in the Spring and Fall usage tapers off and we can go two or maybe even three months between changes. At this point, the monthly recurrence doesn’t make much sense. The next action could be “Inspect HVAC filter”, but the schedule will still be disrupted by delays of one or two weeks here and there. The point is not to avoid using GTD (or even calendars in general) for such reminders, but that recording the next occurence of an action may be best triggered by the completion of the current one and not by a date-driven algorithm. Closure. It does feel good to mark actions as done. If I can’t do so immediately (or at least on the same day), I make sure to do so during my review. Sometimes I know exactly what the next action should be and sometimes I don’t, but taking the time to cross off an action greatly increases the chances that I’m going to figure it out real quick and keep things moving by creating the new action in the system. This post is a follow-up to Part 1 (July 2009) and Part 2 (September 2011). I’m in my fourth year of using GTD at work, and I saw no reason to wait until summer to provide another update. A Powerful Witness. The system of Context Queues (described in Part 2) that I implemented to organize the change-effort folders based on my current involvement — doing, waiting, or done — worked extremely well for me, but it did not settle well with the rest of the team. In fact, I mentioned in my last post that it had been likened to cancer by one person. I had this private little process through which forms and folders would flow when I was working on them, and though it was simple enough to understand, it made the others feel like they were intruding if they ever had to retrieve a folder from my workspace. This was especially painful for them on the days I unexpectedly called in sick. My manager knew that my system was improving my productivity; in fact, it was exposing the variances in our work styles (making us look increasingly inconsistent) and a revealing a few inefficiencies to boot. He also saw some value in my system, but it was not something that he wanted to force the team to use as a whole. This was, in part, because GTD (my adaptations included) seemed so unorthodox and downright cultish. It was a cancer, right? So, we put our heads together and designed a new system based on the Context Queue concept. The Bucket System. I never have liked this name, but it is accurate. The folders we use are letter-size Smead pressboard fastener folders, the ones that require a two-hole punch at the top of the pages. We like these because they are rugged and take abuse well. They fit really well in those five-inch-deep black plastic bins designed to hold hanging folders. We ordered about twenty of those boxes, labeled them with the names of the workflow states, and distributed them amongst ourselves such that none of us has two states back-to-back. Now, we each handle the parts of the change process represented by the buckets sitting on our desks. So, when a change is ready to be deployed to the QA environment, the record in the system is placed into the “QA Ready” state and the folder goes into the bucket of the same name. Whoever owns the bucket at the time is responsible for delivering the folder (which also contains deployment instructions) to the appropriate administrators at the scheduled time. We rotate the buckets periodically just to keep the process standardized and us on our toes. When someone is out of the office, we just divvy up his or her buckets. Despite the fact that we still have to deal with this volume of paper at this day in age, one beneficial side-effect of this system is that our work is very visible. We tried to drive the process electronically, but the folders were just too ingrained in the culture. It remains our interface with the rest of the department. So, our best efforts quickly became an exercise of accepting things we cannot change — well, for now at least. Going paperless is still on our radar. Maybe someday. Collect! Process! Organize! The team still uses a group inbox, except instead of using a single flat letter tray, we have a three-compartment file sorter that hangs on the wall outside of our workspace. This permits a bit of pre-sorting by those who deliver forms and folders to us, but it is still, essentially, just an inbox. What has changed — and this I attribute to the influence of my personal GTD practice — is the way forms and folders are processed. Any and all of us are responsible for processing the inbox whenever we see that new items have arrived. Forms are spot-checked for a few key data points, rubberstamped with the date if found acceptable, noted with a sticky if not, punched with the two-hole punch as appropriate, and dropped into the proper bucket. Folders can simply be distributed without fanfare. Nothing in our process takes only two-minutes to do, but this processing and organizing (delegation of work) is very quick and has paid serious dividends in terms of productivity. Forms don’t get pigeonholed anymore! Look, Ma, No inbox! Yep, that’s right. Since all of my work is now delivered directly to my buckets, I no longer need a personal inbox. I kept it around for a long time, but it stayed empty, so I eventually stuck it in a drawer and freed up some space under my monitors — uncluttered and beautiful. Hot items and personal correspondence still land in my chair, but that happens rarely now, which means these items actually get the attention they deserve instead of getting buried in a stack. Et Cetera. I’ve gotten better at using my tickler file and my desk stays clean. My e-mail archives are quite sparse since I’ve made it a practice to delete messages as soon as possible. I still haven’t worked journaling into my process, but it’s coming. I continue to use my book of record as an inbox for nuggets of information, meeting “action items”, and the like, but now it resembles a check register or (accounting) journal page as each item is date stamped on the day it is recorded and again on the day it is processed into something else, say a note or a work ticket in our ticket-tracking system. I wrote this post for anyone who struggles to make GTD work. When I read another’s work on the topic of GTD and the entire focus is on ‘next-actions’, it is evident to me that the person writing has either never actually read the book or needs to read it again, perhaps several times, because the point of the GTD system was missed entirely. Though David Allen’s tricks for reminding us about what needs to be done are the most visible and heavily discussed elements of the approach, the tricks themselves are not the primary focus of GTD. In subsequent works, Allen refers to meaning overload as a major personal-performance problem, as opposed to the oft-cited information overload. The first step of GTD processing, when something is retrieved from the inbox, is to determine what the thing is, and only then can a decision be made as to what should be done about it. In other words, we must first apply meaning to the thing and determine if we have some commitment to fulfill. The commitment may be limited to keeping the item in reference or it could entail some action, and no commitment at all is a good sign that the item is trash. Projects are commitments that (as defined by Allen) require more than one physical action to complete. Furthermore, the weekly review is supposed to be a time to re-examine the commitments we’ve made to ourselves and to others, and to renegotiate them if necessary. And, a completed next-action may or may not denote the fulfillment of a commitment; indeed, most do not when doing project work — only the last action(s) required truly terminate the project. GTD begins and ends with the commitments, and the next-actions are the vehicle for moving toward fulfilling them. This is what sets GTD apart from to-do lists and other traditional task-management systems. GTD is really about managing commitments, not just actions. I personally believe that this one misunderstanding is the single largest source of frustration felt by those who have tried GTD and failed to glean value from it. Negative testimonials range from simple claims that GTD just doesn’t work (ubiquitously qualified, “well, not for me at least”) or that it is a waste of time, to more exasperated outcries that GTD has “ruined lives” and is the “product of a mad man”. The system’s complexity is a common complaint, but I think that is a symptom of the real problem (because honestly, GTD is only as complicated as you need it to be). No, I think that many of these folks were not using GTD to manage commitments at all, but were focused solely on next-actions. They’d fallen back into managing to-do lists. One way to learn how to do something new is to start tinkering with the tools of the trade. This may not be the most time-efficient, cost-effective, or physically safe method, depending on the skill you want to learn, but despite all that, trial-and-error continues to be one of mankind’s most popular methods of instruction. And these days, tools of the trade almost invariably include software applications. The problem is that most of the GTD applications offered today do not focus on commitments either. Almost all are task-management apps (i.e. to-do lists) with an added context field to make them “GTD compliant”. Some provide the ability to categorize tasks by project, though these are usually just free-form text fields or (better) items in a drop-down list. Needless to say, this works fine for recording next actions, but this model does not address commitments explicitly. What should a GTD application look like? Let’s attempt to answer this question by applying a systems approach, deriving functional requirements from David Allen’s writings. Why am I considering this committment? What’s to gain? To lose? Am I available or do I have a prior commitment to honor? Who should I invite? Are they available as well? What will it cost? Is it a good deal? How will this affect the budget? Notice how these same questions could be asked with respect to any potential commitment. Answering the first question is a cognitive expression of desired outcome and the other questions concern generic constraints: time, people, money. Capturing the considerations made regarding this decision may prove useful if the commitment must be renegotiated or broken at a later time. What must be performed exactly? Who is assigned the task? Must it be done on/before/after a certain time and date? Under what conditions must the action be completed? In what context? The following Entity-Relationship Diagram (ERD) represents one way in which the information gathered above could be logically organized. (ERDs are used by analysts to map real-world concepts in a way that facilitates the design of relational database tables and other data structures.) The attributes for the “Commitment” and “Action” entities were derived from the questions above, or more correctly, from the anticipated answers. As indicated, these entities share a particular relationship: a commitment is a promise to do some action (or combination of actions), and an action fulfills (in part or in whole) one and only one committment. Strictly interpreted, “next action” implies that only one can be defined at a time, so a one-to-one relationship would be appropriate; however, this is not necessarily efficient or practical, especially for complex commitments. It is possible to have concurrent “next” actions as long as they are independent, and these actions may differ in context, and assignee as well, so the argument that a person can only do one “next action” at a time goes out the window. The user must be able to create new Commitments and mark them as fulfilled as appropriate. A desired outcome gives rise to a new Commitment; thus, this field is always required. To promote immediate discernment of “next actions”, at least one Action is required for unfulfilled Commitments. When an Action is marked complete, the user must either create a new Action or mark the Commitment as fulfilled. Next actions are assigned to self by default, or may be delegated. Action context is always required. Action duration is never required. Use of this field is encouraged. Action due date is never required. Use of this field should be limited. A Commitment list must be provided with enough detail to facilitate weekly review. Action lists must be provided for each context with enough detail to facilitate Action selection in the moment. Artifacts (soft copy) may be attached at any time. This list of functional requirements is for illustration only and admittedly informal and incomplete, but it drives home the idea that the software can drive good GTD practices instead of obscuring them. The GTD application described above doesn’t just encourage proper use of GTD principles, it enforces them. Notice, for example, that the Action entity has no priority attribute. This was omitted on purpose, as the prioritization of actions is antithetical to GTD practice at its core. The inclusion of this field, incidentally, is another indicator that most GTD apps are not properly designed. An extended task management application would have already included this attribute as part of its existing model, and the inclusion of this field in new GTD applications is easy to rationalize “just in case you wanted to use it” or “because it is such a common feature”. But then, challenging the effectiveness of traditional systems with common features is exactly what GTD does. In the book, David Allen uses artifacts in two basic ways. The first and most obvious is as an indicator that something needs to change because it isn’t “what it should be and where it should be”. This results in either immediate action or a promise to one’s self to take action later (i.e. a commitment). The second is as a reminder. Slipping that mailer into the tickler file or putting the needed file folder under the car keys by the front door are ways in which the artifacts themselves become reminders. But an artifact is not the same as a commitment. Some ‘GTD’ applications are available that convert e-mails into next actions. These are usually “add-ons” or “plug-ins” to popular e-mail platforms. This approach is based on the premise that there is a one-to-one relationship between e-mails and next actions. It’s not always that clear-cut. I may have a dozen e-mails that are informative in nature and that indicate in aggregate that I have the responsibility or wherewithal to effect a change. Which, if any, do I use to spawn a new next action? None fit the bill, but that doesn’t eliminate the commitment. While the functional requirements above describe an adequate system with a proper relationship between commitment and action, any GTD practitioner will notice that a few key features are missing. There’s no calendar, “Waiting For” list, or tickler file. So how can one delegate next actions, defer the assignment of meaning to an artifact to a later time, or define the “hard landscape”? Obviously, the data model could be expanded and these functions added, but I think a little abstract thinking can go a long way. To promote constant progress, at least one Reminder is required for unfulfilled Commitments. When a Reminder is cleared, the user must either create a new Reminder or mark the Commitment as fulfilled. To reduce noise and boasting, cleared reminders are removed from view. Assignee is always required for “Next Action” Reminders, assigned to self by default, and is not available on other Reminders. Context is always required for “Next Action” Reminders and not available on other Reminders. Duration is never required, and is available on “Next Action” and “Calendar Entry” Reminders. Date is required on “Calendar Entry” and “Tickler” Reminders, and not available on “Next Action” Reminders. Context lists must be provided, listing “Next Action” Reminders with enough detail to facilitate ad hoc decisions. A “Waiting For” list sorted by assignee must be provided to present delegated “Next Action” Reminders. Calendars must be provided, including daily, weekly, and monthly views. A Tickler File must be provided, listing all “Tickler” Reminders for the current day. Now it’s a matter of presenting reminders on appropriate lists. The context lists show next-action Reminders just as before. The calendar view could be a simple listing grouped by date or a traditional analog calendar. The tickler would be the same as a calendar listing, but limited to ‘today’, and the same date field would drive both. The first model above allowed for the delegation of Actions to assignees, and those action Reminders could be presented on a “Waiting For” list; in fact, looking ahead a bit to design, assignment of an “Next Action” Reminder to someone other than “me” could force the value of the context field to an otherwise-unselectable “delegated” context, guaranteeing that the action will never be visible on both the “Waiting For” list and some other context list at the same time. Notice that a Reminder cannot have both a date and a context. This is one way in which extended task-management systems fall far short in promoting good GTD. According to Allen, next actions should happen as soon as possible — that is to say, as soon as the conditions are right: context, energy level, available time, etc. — and calendar items must happen on the designated day/time or not at all. One is very flexible and the other very rigid. The model above forces the user to choose only one way to manage the Reminder. Various enhancements can be added in the design phase. For example, objected-oriented design and implementation would undoubtedly lead to a Reminder class and various subclasses for next actions and the like. Such a superclass could permit the user to create custom Reminder types as well. But, for the purposes of this posting, I will leave those considerations to others. The weekly review seems to be a big sticking point for many folks, for both GTD practitioners and for those who have given up. David Allen is adamant in all of his writings about the power and absolute necessity of the weekly review. But when next actions are the focus and Friday afternoons are spent doing nothing more than browsing calendars and context lists, the results can include boredom, frustration, lack of direction, despair, and a flood of ‘blog posts denouncing the promised virtues of GTD. Why has this project not moved in the last week? Are the right (types of) reminders in place? Are the next action reminders in the right contexts? Are there hidden dependencies between these actions? Who should I call right now on the “Waiting For” list? These questions cannot be answered by a cursory review of scattered reminders. Remember that the commitment is, as Allen would phrase it, a stake planted in the ground to which related activities are tethered. Keep the commitments on the top of mind and avoid getting lost in the details. The Context List concept is probably the most recognizable feature of GTD. If a friend, family member, or coworker possesses file folders (or just about anything for that matter) bearing nicely-printed labels such as @Calls or @Shopping, it is almost certain that this person uses GTD. As simple as they seem, contexts represent aspects of personal lifestyle and can be as diverse as the people defining them. Is it any wonder that contexts spark the hottest debates in online GTD circles. NOTE: Before spending a lot of time on next action contexts, be sure to understand how the focus of GTD is really on commitments. A “context” list is simply a list of physical next actions that share some unique prerequisite or constraint. All that is needed for one to complete any or all of the actions on a context list is for one to choose to place oneself into that context with all the necessary resources available. The context in which an action may (or must) take place is determined early, when the action is first identified as the “next” one. A textbook example is @Calls (or @Phone), the list of actions that can be performed when one has access to a phone and the time to use it. Of course, this list will probably consist exclusively of phone calls to be made, but it is quite easy to see that the @Internet context could encompass a more diverse set of actions such as doing research, paying bills, writing emails, etc. My definition is a bit more explicit than Allen’s, but I believe that many of the common problems people have with defining contexts (see below) could be attributed to the lack of understanding that contexts must be properly bounded, that contraints are an overriding factor in their establishment. David Allen suggests a list of contexts in the book, and this is a good starting point, but it is not logical to assume that this list will be a perfect fit for everyone. Believe it or not, there are purists out there that try to operate using only the prescribed contexts. Times change and while people in society operate in generally the same way, people have different styles. Technology changes too. The specialized context “@Email” is different than “@Internet”, which could more properly be renamed “@WWW”, but why not “@Facebook”, “@Blog”, and “@Ebay”? Then again, is this specialization really needed? The answer is, whatever works best given a set of constraints that govern when, where, and how something should or must be done. IMHO, this is one of the most fun aspects of GTD, and yet, the most discouraging one as well. A lot of people have posted their difficulties in using contexts and many have given up trying to use them (and sometimes GTD) altogether. There are several common issues that seem to resurface, and I’ve managed to experience every one of these in my own GTD implementation, so I can relate. This is not an exhaustive list and it may grow over time. List Size. Many people complain that their lists get too big to manage. When they enter the context, there are too many things to evaluate, so nothing actually gets done. If lists are too few, then (obviously) each list will gather more entries given the same number of actions. This could also be an indicator that they need to place themselves into that context more often or for longer periods of time so that they can actually get more done. Overcustomization. This is the opposite problem from the one above. Too many specialized lists will become a burden on all levels, when processing and organizing new things to do, when finding something to do in the moment, and when conducting the weekly review. The result is subconscious resistance to the system overall. Such constructs have traditionally been called “pigeonholes”. For example, as mentioned above, does one really need an “@Ebay” context list just to accumulate the list of things to consider buying from there? If I had this context list defined, am I really going to think about looking at when I’m at the computer? Or only when I have to make some other, more urgent purchase and I happen to remember to look at it? For how many other sites should/must I define context lists? There are several better ways to handle this information. The simplest would be to do away with the specialized list and add the actions to the more general @Computer or similar list, but I personally think doing this adds noise. Instead, keep a shopping list in reference and make it a habit to review it before finalizing any purchase (at a minimum) to see if anything should be added to the cart. Add a tickler reminder to review it periodically, say every two weeks; though, using the list itself as the reminder is not the best idea, since it should be easily accessible whenever random new items must be added. Overlap. Consider the following contexts: @Desktop-Online, @Laptop-Online, @Laptop-Offline, @Office-Online…etc. These contexts were designed to avoid overlap. While it may be legit to have a task that has to be done with special software that is installed only on the laptop which also requires Internet access, this level of customization is prohibitive. In the book, Allen discusses setting up identical work spaces in various locations, at work and at home for example, and about having a mobile workspace as well. This uniformity will ensure that the necessary tools are always available, and thus, eliminate the need to specialize contexts in this manner. This may mean paying for mobile broadband access for that laptop, as if that were a bad thing. Project Focus. Deferring an action until I’m “@Working on Project X” is not appropriate. For starters, “@Working on Project X” does not indicate one thing about the environment in which the work must take place. It’s also not efficient, because a shifting gears to make a phone call and then again to do something else, all while “@Working on Project X”, actually works against the GTD mechanism. The whole purpose for using contexts is to group similar tasks. Besides reliance on common resources (constraints), humans tend to work faster and with more consistency when doing repititious actions. Don’t misunderstand me — setting aside a block of time to focus on Project X is not a bad thing, and the quality of the outcomes for each action may actually improve if creative juices are flowing around a project, but that doesn’t mean the context is appropriate. In my experience, using a digitized system that allows me to assign each task to a project folder as well as a context is highly useful, because I can crank through the actions in times of focus (via the folder) or while in context (@Phone). They are just two different views into the same database. I’m not sure how one would accomplish this using a paper-based system without having to create multiple copies of the same action reminder to be stored in different places. @Anywhere. “Anywhere” is a code name for “No Context”. Avoid it. Besides, “think about” is the only action I know of that can be done literally anywhere. Non-Context Attributes. Priority, energy level, and other such attributes are not contexts. Like the aforementioned project folder concept, these are other criteria for selecting what to do in the moment. Given high levels of energy or an action with a very high priority, one will be motivated to change their context, immediately if necessary, to get that action done. So, what do good contexts look like? What makes them work? If I had to sum it up in one single answer, it is the proximity of the contexts to reality that makes the difference. This proximity is based on constraints. I don’t want to recommend specific contexts here. Instead, I’d rather present the attributes of good and useful contexts based on my own experimentation. The list below — only two factors — is a reduction of a much longer list, distilled over the last few years. Access. Contexts are only useful if they are accessible, that is to say that you can and do put yourself into them, preferably with some regularity. Since you define your own contexts, constraints are completely self-imposed. You have to make yourself available to get things done. In his writing, Allen often finds himself in this context or that. He happens to be running errands and wants a list of places to go and things to buy, or he happens to have an extra thrity minutes for phone calls because a meeting was cancelled. Not me. When I have calls to make, I need to go make them. I usually have to make the time, not wait until I discover it. Sometimes I have to drop what I’m doing and force myself into @Phone at 8:30 AM on a weekday, because the calls on the list are important, or someone is waiting (read: nagging me) for information that I must obtain during the call, or the list itself is just getting too long. Some contexts are more natural than others or are easy to enter because they “just happen” routinely, such as @InboundCommute. In contrast, a context that is so contrived or obscure that it is difficult or impossible to enter it (frequently or at all) is not useful, and it would be better to schedule time for such actions on the calendar instead. In the same vein, some contexts entered frequently or even routinely are just not necessary, such as @BathroomSink, @DentistChair, and @Asleep. Resources. Pens, paper, the computer, the Internet, reference books, people, and above all, time. These are hard constraints. I can only discuss this topic @Manager or that topic @Wife. I can type this @Computer, but I have to research that @Internet. If I have made my workspaces (reasonably) identical, the same action can be done @Home, @Work, @Library, or even @Car; in this case there is no difference in the hard constraints, so why have three or four different context lists? Location is a pretty hard constraint if you let it be. When you know that you are allowed to move between contexts and not just wait for them to happen, drawing boundries between them based on resource constrints becomes much easier. If you have to decide to put an action on one of two lists, and the lists have four out of five resources in common, then you just wasted time and effort. Are these contexts really different? The answer is in the constraints. Adding gear or changing some other factor can loosen the constraints and the two contexts are now one. Defining distinctly-different contexts based on constraints and allowing only a little overlap if any at all will make it very easy to determine which context you are (or could be) in at the moment. The following articles and posts, in no particular order, helped me understand contexts along the way. Some influenced my thinking more than others. Using Renaissance Soul Focal Points as GTD Contexts post on The David Allen Company forum. I noted previously that Allen’s two-minute processing heuristic isn’t realistic, at least not in my implementation experience at work. One day, I found a few undedicated minutes remaining before a meeting and decided to process whatever I could in my inbox. As I picked up the stack, I reminded myself of the two-minute rule and thought, “Gee, I don’t have all that much time – I wonder what would happen if I limited myself to a thirty-second rule.” As I processed, immediately doing anything that would take thirty seconds or less, my mind travelled back to what I had written about needing, not a two-, but a ten-minute rule, and I started to wonder if this shift was due to a change in my work, my work habits, or maybe something else. What factors were at play here? Was it the context? In any case, the main take-away for me was that the two-minute heuristic is just that, a rule-of-thumb that can vary as necessary. Sometimes I’m in ten-minute mode and sometimes I’m in thirty-second mode. If I had an entire day with nothing to do – absolutely no commitments – but to process “in”, I wonder if I would allow myself a thirty-minute rule? On second thought, maybe that’s pushing it just a bit. I began documenting my GTD implementation at work in July of 2009. In the last two years, several things have changed, so I figured it was time for an update. The Fallout. Taking the plunge was a risk, so I talked GTD up as something that “just makes sense” (which it does, so I wasn’t lying). I admitted that I was experimenting and that I was going to do so 100% until I discovered that it “just doesn’t work after all” (which hasn’t happened yet). Many coworkers started to treat me like I had joined a religious cult or Amway. Nevertheless, I stuck with it and while no one really ever embraced it, I could tell that others were becoming more comfortable with me doing it. Win. What Hasn’t Changed. The way my team worked as a whole did not change. We still have our group inboxes, both physical and e-mail, our standardized processing, and such. 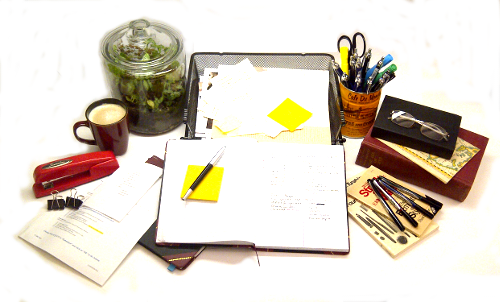 I’ve kept my clean-desk policy, though I’ve struggled to follow it from time-to-time, usually in the busy periods. I still have my tickler file, my general reference, and my gear. I’m still in “reduction” mode, leaving as few things (if any) in my e-mail inbox as possible. I love not having to worry about things that I know don’t exist anymore anyway. I still have my physical inbox, front-and-center between my monitors, and my coworkers have done a great job of respecting my preference over using my chair as “in”. I do still get “hot” items in my chair, and because these usually are truly urgent, I don’t complain too much anymore. Outlook Tasks. I remember being so excited about using Outlook to record open loops and next steps. I could even access them from my company cell phone. This didn’t work well for several reasons, some technical and some behavioral. I may document the details at some point, but suffice it to say that I abandoned Outlook Tasks after two (maybe three) attempts. The Book Of Record. My book of record has fallen into a serious state of disuse. This is due in part to a marked improvement in the quality of meeting agendas and followup minutes/notes within the department as a whole. Agendas are either printed or sent electronically by the person holding the meeting. Also, as my team has shifted from workflow improvement to a more operational capacity, notes are usually recorded in our ticket tracking system, not on paper. We also consolidated our project-work files into a shared directory, and now, when we meet, we often focus on how the docs should change and not on white-board sketches or strictly verbal presentations. Contexts Revisited. The contexts I defined before were spot on; however, my job responsibilities changed a bit, so I ended up eliminating two of the four contexts. Specifically, the prep work for both the weekly planning meeting and the staff meeting shifted to someone else. That left @Desk and @Rounds. After a while, these folders became more trouble than they were worth, so I voluntarily dropped those as well, replacing them with three special context queues using letter trays. Context Queues. As I mentioned in the post two years ago, the work my team performs is highly structured. We coordinate the changes made to our computer systems. Each change “effort” is represented by a ticket in our ticket-tracking tool and each has a folder to contain the paper byproducts of the process. These folders typically live in one of two file cabinets, depending on whether the effort is active (in deployment, testing, etc.) or closed (pass or fail). I determined that the folders on my desk at any point in time were in one of three queues: doing, waiting, or done. I found a set of three hanging-style letter trays that would easily accommodate the bulky folders. To make my coworkers (outside of my own team, of course) hesitant to take folders (which becomes a problem on occasion), I labeled them using Latin: Expedio, Exspecto, and Humo respectively. For my own edification, I thought it was appropriate to use first-person, present-tense, active-voice, indicative verbs. The first two are the etymological ancestors of “expedite” and “expect” in English, simple enough to recognize, but the third, “Humo”, is not so intuitive. This means “I bury”, which is what I do with folders for completed efforts – I bury them in the archive file cabinet. New Challenges. Overall, I think GTD is a good fit for my personal work environment and has led to some gained efficiencies; however, I have noted a few issues. First, a minor problem, reminders to do things would make their way into my tickler file; this is appropriate until I am out of the office unexpectedly, at which point the rest of the team now has to deal with my tickler file. One way to mitigate this was to add an electronic note to the ticket and then slip a printed copy of that into my tickler. The second problem is much larger. My GTD implementation has developed a bit of a bad reputation. It has been called a “growth” (think: “tumor”) to our already-structured system. I suppose I did graft it into the process, so to speak. Efforts would travel through the normal work flow, but they entered some sort of “subsystem” when they hit my desk. We have discussed implementing a set of queues that would eliminate my three context queues without losing the benefits. By policy, our e-mail is deleted after a specified retention period. Individual messages may be retained longer, but they must be tied to something to show their usefulness. I need to work on integrating some form of journaling into my inbox processing.